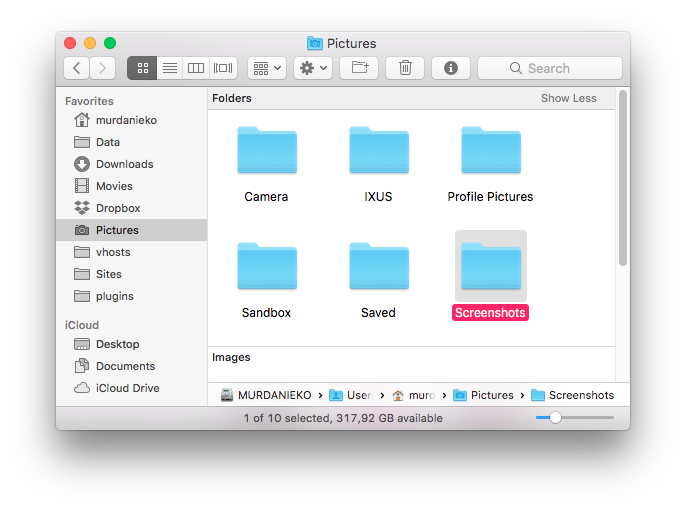 MacOS have a built-in screenshot feature which can be used right off the bat. This feature is an important one which I previously never met in Windows environment. It’s so helpful to chat and give instant example of my screen. First, I create a dedicated screenshots folder via Finder. The first command, sets the screenshot location to defined path, and the seconds restarts the SystemUIServer so the alteration can be recognized instantly by system. This means the only steps we need to do is create a conf file inside /etc/nginx/conf.d/ directory. For a reminder, creating a conf file inside the conf.d directory will be auto-included from nginx.conf file. The configuration content below is meant to be put inside http block. Let’s name it badcountries.conf. Next step is check the $allowed_country variable against the current visitor’s IP address. Put this code inside server block. Restart nginx after editing is done. Now, every visitors coming from countries you defined as no inside badcountries.conf will be served with 444 error code. For the list of ISO 3166 country codes you can put inside badcountries.conf file, follow this link. After upgrading to MacOS High Sierra (or any upgrade process previously), first thing I need to check is the local webserver status: apache, php, redis, mysql. 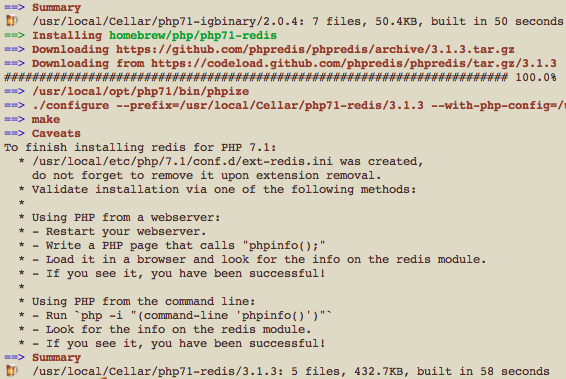 Brew install php redis. Thankfully, MacOS High Sierra is now shipped with PHP 7.1 installed, which met the new standard for my future web developments. 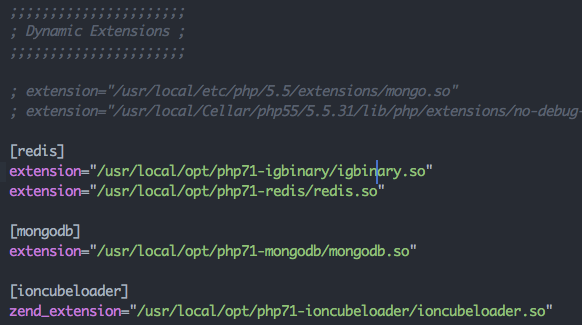 PHP-redis is a must-installed library since I love the MySQL + Redis tandem for handling data storage and requests. Of course, along with the newly upgraded OS, the Apache installation in fresh installed with standard “It works!” welcome page. Now, into the installation steps. Easier said, I simply shot brew install php71-redis into Terminal and then served with Error, suggesting that I need to install Xcode Command Line Tools. I tried to install again the library, but another error came along. It said the installed formulae was conflicting: different php versions install the same binaries. It suggested me to unlink all php 5.6 libraries. Ok then..
Hopefully this attempt for installing php71-redis library was a successful one. Edit /etc/php.ini, add the extension as follows. If the php.ini file not exist, copy the php.ini~previous. Don’t forget to include the igbinary extensions too, so you won’t get problem my previous php56-redis module not loaded here. MacOS High Sierra problem when executing php command through terminal. Problem? An error stating dyld library not loaded. According to this stackoverflow post, I need to uninstall current version of libjpeg. Use --ignore-dependencies to force uninstallation since libjpeg is needed by other library dependencies. The command will produce warning since latest version of libjpeg has already installed Warning: jpeg 9b is already installed, it's just not linked. Simply we can shoot brew link jpeg command into Terminal, and all our problem should be solved. After macOS Sierra 10.12.6 Update, my php56-redis module is not working, causing some of my PHP applications cannot communicate with Redis as storage engine. My confusion raises when the module is loaded in PHP-CLI but not in PHP-CGI. It means, if I type php -m in command line, redis shows up. But, if I access via browser via phpinfo(); nothing says about redis. I googled for nearly two days, until I realized that I haven’t look for a file which I should investigate the first time any errors occured in PHP: error_log. In macOS, the logs are located in /var/log/apache2/ so the file is located on /var/log/apache2/error_log. I open the file via Sublime and then voila … Here comes the essential hint. I remember that I never typed any of these igbinary module in php.ini, so this is new case for me. Maybe after macOS Sierra last update, the module is not loaded automatically. I’m sure I have this igbinary module installed, however I try to install it again via Homebrew. Of course, it results in error message homebrew/php/php56-igbinary 2.0.4 already installed. This means the binary has been installed within the modules directory, all I need to do is define its inclusion within the php.ini file. 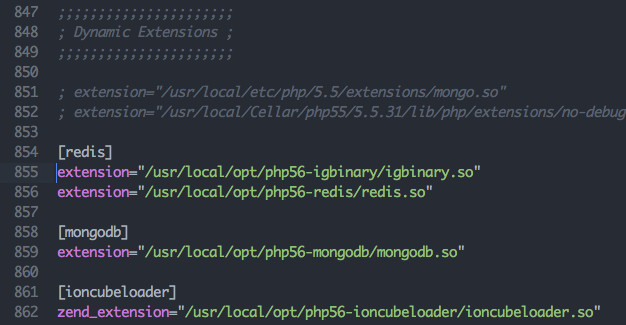 I add one line statement right before the php56-redis module extension. Restart apache, then everything just back to normal, like the good ol’ days. Seperti yang digerutukan oleh Raymond Reddington dalam artikelnya di medium TELKOM Indonesia Secretly Injects Advertisements, Telkom ads memang sejak lama melakukan praktik ini. Yang dirugikan tentu pengguna layanan IndiHOME (dulu Speedy) yang notabene sudah membayar harga yang tidak murah untuk mendapatkan layanan internet bulanan. Sebelum menggunakan IndiHOME, saya menggunakan provider XL yang juga sama curangnya: menginjeksi iklan ke dalam halaman web yang saya akses. Lebih parah, XL tidak hanya injeksi script tapi juga iframing website yang mengakibatkan gagal berfungsinya website yang menolak diakses dalam iframe. Sebagai contoh, jika saya menggunakan XL untuk mengakses situs Histats, maka saya tidak akan pernah bisa login karena akan terus redirect oleh sebab cookie yang ada tidak terbaca karena kondisi site yang diakses dalam sebuah iframe. password with the command SET PASSWORD = PASSWORD(‘your_existing_password’).